As a service provider and contractor for technical documentation, software documentation, and software user assistance, I optimize user manuals, online help, and screencasts. I can analyze your documents both from the users’ perspective and in respect to the creation process. The result is clear, user-friendly, and cost-efficient documentation. 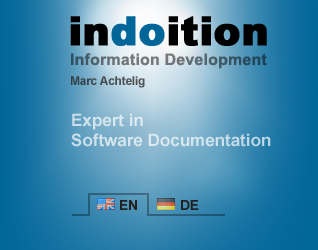 Have you already created some technical documentation (user manuals, online help, screencasts) for your products? Are you not quite satisfied with the current documents? Or are you unsure whether your current printed documentation or online documentation meets all the requirements? Have there perhaps even been any complaints from users or have you noticed large numbers of support calls relating to specific issues? I can analyze your documents both from the users’ perspective and in respect to the creation process. I can then work out suggestions for improvement. In most cases, the key weaknesses can be identified quite quickly so that the review does not take much time. As a result, you either get a written report of the analysis plus a list of suggested improvements, or I can present the results in person. In case I present the results in person, we can add a discussion to work out an implementation strategy.